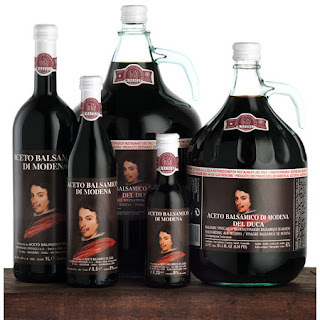 Over the last couple weeks, I have had two occurrences of people asking or talking about Balsamic Glaze or Balsamic Vinegar. So I think I should add it to my recipe box! Take 2 cups Balsamic Vinegar and bring it to a low boil in a heavy bottomed non-reactive pot, some people do not suggest bringing to a low boil and just bringing to a "light" simmer. Reduce heat to a simmer, simmer until reduced by 75% or 50%, depending on desired viscosity. Do not burn, stir occasionally. Store in a syrup container or clear squeeze bottle, it is okay to store at room temperature. Use to garnish steamed and fresh vegetables, fruits, salads, fish, and ice cream! If too thick add a little water and if too thin continue to simmer. Times vary depending on pan. This works for reducing wines and other types of vinegar.